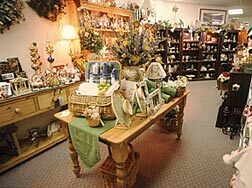 At Caring Gifts, located in convenient downtown Concord, NH our staff helps you design a very distinctive gift, one that reflects you, your company or organization. We specialize in creativity, and have assembled very special gifts and gift baskets, from one to ten thousand for individual and corporate clients throughout the country. Let us design a packaging concept that will make you or your company say what you want to say. Our clients come to us again and again to help them assemble gifts and gift baskets that truly delight the recipient! We work with you to put it all together in the most creative, appropriate and cost effective way possible. What makes up your special gift or gift basket? We offer an incredible range of options from dried floral arrangements to fine brass and crystal. Wines, champagnes, candies, chocolates and coffees can be selected from our gourmet food department. Our baby boutique features infant clothing, toys and accessories. A visit or phone call is sure to get your creative juices flowing! We are here to help you send a gift that shows you care. We expertly package your gift for shipping worldwide, or deliver locally in our company vans. Perhaps most importantly, we make your gift giving fun. Visit us at our convenient downtown Concord, NH location. You can also call us (toll free) or fax us. We look forward to helping you make a lasting impression with your own custom Caring Gift. Consistantly voted #1 Gift Shop in Concord Monitor's "Best of" event.